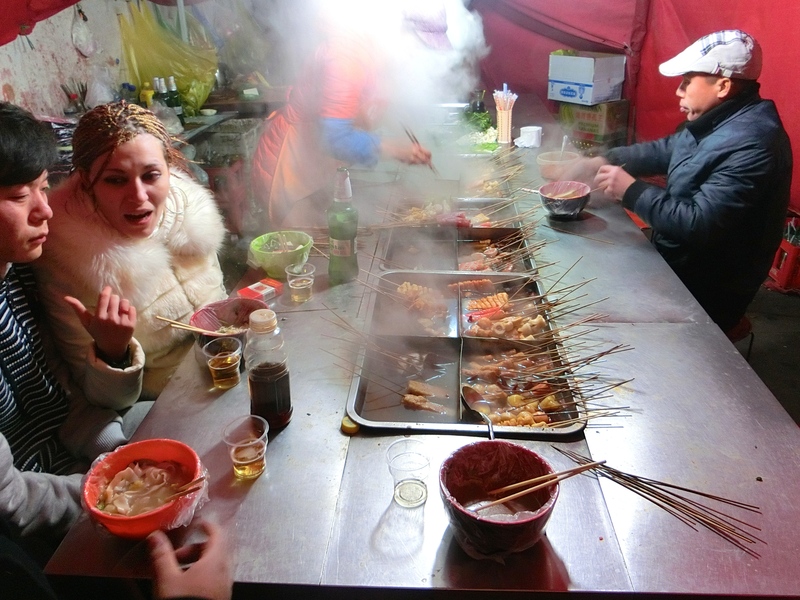 Hot Pot is a popular meal to have in Zhengzhou. You can go to a Hot Pot and order a type of broth that is spicy or you can have a non-spicy type. The broth or soup is then placed on a burner that is built into your table and from there you can pick all types of food to put into your soup. You can also make up your own spices. It’s really good and fun to go with a group of friends. 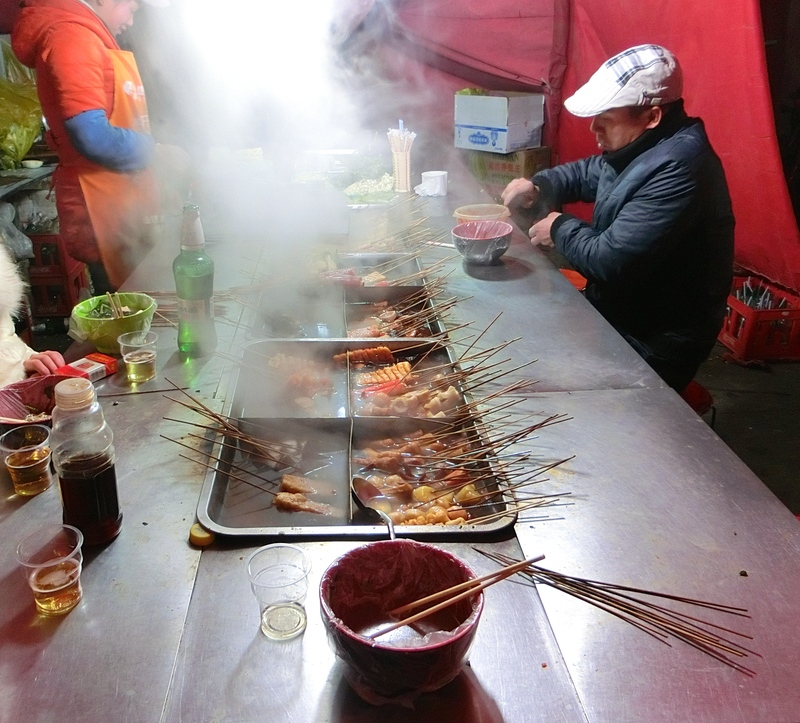 This is a Hot Pot tent that was open at five in the morning. It isn’t exactly the cleanest of choices when it comes to having hot pot but it is an experience. My friend and I met a Russian woman and her Chinese boyfriend and they led us down a dirty alleyway to this tent. Your bowl is covered with a plastic bag before the soup is poured. You can pick you food from the chafing dishes in the center of the table. If you want noodles the woman who worked the tent cooks them for you. 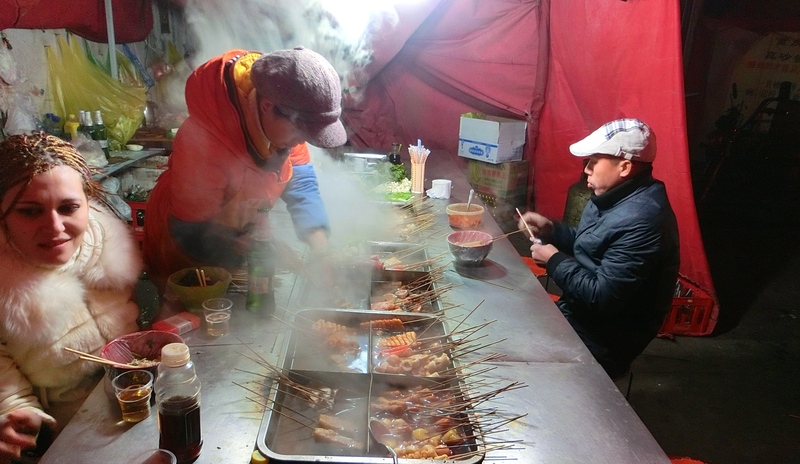 Many of the workers from the club ended up at this tent which led me to believe that Hot Pot in the early morning after the bar scene ends in China is the equivalent of hitting some cheap fast food diner in America. This entry was posted in China, Zhengzhou and tagged China, color photo, Henan Province, Living in Asia, Living in China, Middle Kingdom, North China, people of china, photography, travel, Travel Asia, Travel China, Zhengzhou. Bookmark the permalink.